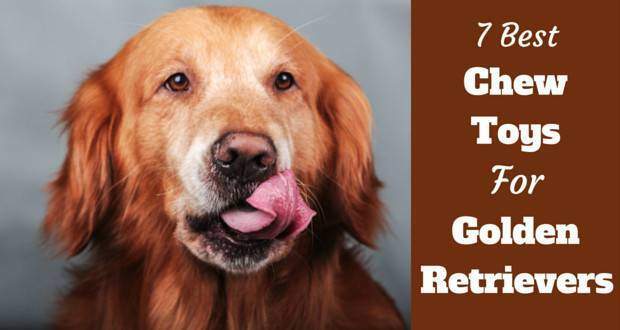 Golden retrievers are some of the most playful, fun and loyal canine companions around, but if they have one tiny fault, it’s that they can be very heavy chewers. As ‘retrieving’ dogs, they love carrying things around in their mouths and – while it’s in there – they might as well have a good chew on it! With so much playful energy, their heavy chewing can sometimes border on destructive. There’s no rawhide or chew toy to hand, your shoes, furniture and curtains might turn up totally battered in a matter of hours. That’s why investing in a really high quality, durable chew toy will be one of the best decisions you make as the owner of a golden retriever. Not only will it quell any destructive chewing, but it will also provide the mental and physical stimulation your pup needs to expend their energy and have a great time doing so. There’s a huge amount of chew toys on the market and it’s easy to get overwhelmed by choice. Here’s what you need to consider before you buy. 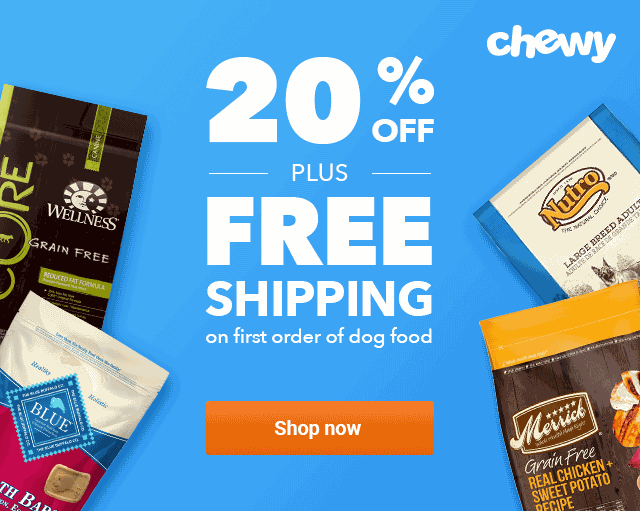 *The above links lead to current prices and customer reviews on Chewy. Carry on reading to discover why we made these choices, and lots of tips and buying advice to ensure you get the right product. 3 Are There Toys That Last Forever? As always with dogs, safety is the most important rule to abide by. There’s no point to a fun and engaging toy if they’re only going to break it into pieces. Choking hazards are a real risk with chew toys that just aren’t durable enough. Whatever toy you choose, it’s really important to supervise your dog while they’re enjoying it. Even if it’s labeled as ‘indestructible’, there’s still a chance that they could break off bits and swallow them. As well as potentially choking on them, broken toys can cause a host of internal problems too. The best chew toys are hard and durable, but there are a few other things that you should look out for when making a decision. If possible, always opt for toys made of non-toxic materials. That way, if they do chew off and swallow any, the internal damage can be somewhat mitigated. Also, look for toys that have a little bounce-back in them and aren’t too hard: not only will their teeth thank you, but your dog will be better able to engage with the toy if they can really sink their teeth in. Are There Toys That Last Forever? Never trust the ‘indestructible’ label that some of these toys are marketed as. If you see bits coming off the toy or a visible decrease in its size, it’s time to throw it in the bin and get a new one. 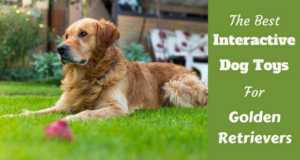 As with so many products that are aggressively marketed these days, the best way to judge what’s best for your golden retriever is to see what works for others. 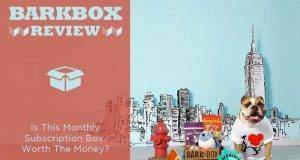 Read online reviews, talk to other owners and check out articles like this. Not all expensive dog toys are high-quality, but most high-quality dog toys are more expensive than the run-of-the-mill toys you can pick up for $5 at your neighborhood store. It’s best to view a chew toy as an investment. Spending a little more money now to get a durable, safe and fun toy is cheaper in the long run than having to continually replace cheap toys that your dog can destroy within hours. As with any product, the best materials will necessarily cost a little more. Certain materials lend themselves to durability – one of the most important features of a high-quality chew toy for golden retrievers. Although there’s no such thing as indestructible when it comes to chew toys, hard rubber is about as close as you’re going to get. Favorite brands like KONG and Goughnuts make some of the toughest and most durable toys on the planet, and they use special formulations of hard rubber to achieve this. Golden retrievers and other heavy-chewing large dogs are the perfect customers for the hard rubber toys – they’re tough enough to take a few rounds of power chewing while providing enough stimulation to keep them engaged. Some of the best hard rubber chew toys can last for years if you’re lucky! A close second to hard rubber is the huge balls of rope that many dogs love playing tug-of-war with. Their sheer thickness provides enough of a tough surface for retrievers to really get their teeth into and, if strands do start to come off, they are easily passed through your dog’s digestive system (and will even floss their teeth for them!). They’re also easy to wash and a brilliant interactive opportunity for you and your dog. With heavy chewers, there are some materials that simply don’t cut the mustard. While plush toys are certainly becoming tougher with multi-stitched seams and stronger threads, they’re still no match for the jaws of a golden retriever who wants to get stuck into a good chewing session. The plush fabric can be torn apart easily and swallowed. Any stuffing and squeakers can be swallowed too – a definite choking hazard and something that could cause internal damage. While vinyl and latex are often marginally stronger than stuffed, plush toys, they still don’t cut it in the durability stakes. Like plush toys, they can easily be chewed apart in a few hours by a power chewer, and the likely included squeaker is again likely to cause health problems if swallowed. While plastic is often just about hard enough to withstand the jaws of a heavy chewer, it scratches up incredibly easily and – if it does break – could see your dog swallowing sharp bits of plastic. It also doesn’t allow the same give and ‘bounce-back’ that hard rubber allows, making it much less engaging and interesting as a toy. We’ve put together a short list below of 7 fantastic chew toys that are great quality, fantastic value and perfectly suited to a golden retriever. These toys will keep your pooch entertained for hours, and hopefully your belongings intact and safe for far longer. 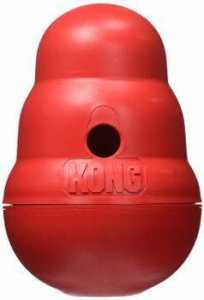 KONGs are rightfully one of the most popular toy brands for golden retrievers. Incredibly tough and durable, they’re able to withstand a lot of pressure from gnashing teeth and can last for years. This ‘Wobbler’ toy combines a chew toy with a food dispenser, and is both mentally and physically stimulating. The idea is to stuff it with treats or kibble and let your retriever toil to get it out; keeping them busy for a few hours. First, they need to control the wobbling toy and stop it rolling away from them! 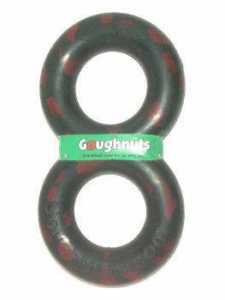 Goughnuts is another quality brand that many think rival the durability of KONG. 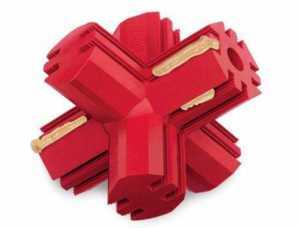 This ring chew is well known among owners of heavy chewers for being virtually indestructible. As well as being super tough, it’s also safe for your dog to really get their teeth stuck into. 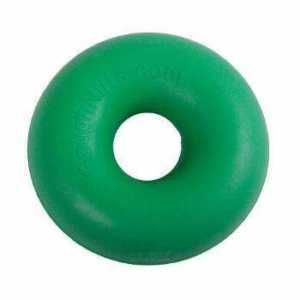 It’s made of two layers of rubber – the outer green layer means “GoughNuts”, while if your retriever chews through to the inner red layer, it means “stop”. West Paw are another brand who specialize in high-quality dog chew toys. This Hurley bone chew is the perfect toy for golden retrievers that love gnawing on rawhide and playing fetch. It’s known for being very tough and durable, even in the jaws of heavy chewers, but rest assured that if your dog does manage to swallow any bits, the toy is FDA compliant and should cause minimal problems. As always though, supervise your dog while chewing in case there’s a choking hazard. Will float in the water and bounces – great for fetch! 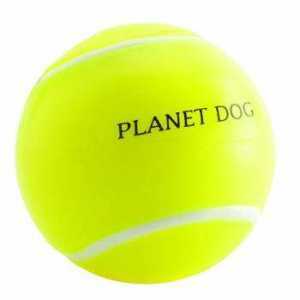 If your dog loves chewing on tennis balls but destroys them within a matter of hours, then these Planet Dog balls could be the answer. They’re much more durable than normal tennis balls and can easily withstand the pressure from heavy chewers. Like a normal ball, they can bounce, float and are great fun to play with, for dogs and humans alike! If you’ve got a power chewing Golden Retriever who loves a game or two of tug-of-war, you’re going to love this huge rope toy from Mammoth. As well as being great fun to play with (and not to mention good exercise for you both! ), this toy also serves as a great flossing tool for your dog’s teeth as they chew. The cotton strands are safe to chew on and will be easily passed through your dog’s digestive system if swallowed. It’s absolutely huge ­– the Super X-Large is 72 inches long and has five knots to get a grip on. Great for large dogs! This is another product from Goughnuts and another interactive tug toy. This is made of rubber rather than rope, however, so is truly very durable and strong – perfect for golden retrievers and power chewers. This is made of the same super strong hard rubber as the Original Dog Chew Ring we’ve listed above but comes with the fun, interactive aspect of tug-of-war! There’s a 1.5” cross-section so it’s safe for your dog to play with either a human or another doggy friend! That’s right, it’s KONG again with one of their most fun offerings in dog chew toys: the Jump N Jack Dental Dog Toy. Perfectly bouncy for games of fetch, the durable rubber formula can take a good chewing from your Golden Retriever. The ridged design can be stuffed with treats for dogs who need some extra stimulation, while it also helps clean your pup’s teeth at the same time. Very bouncy and unpredictable – will keep your Golden stimulated in extended games of fetch and catch! Hopefully, you’ve now got all the knowledge you need to buy the best chew toy for your golden retriever. 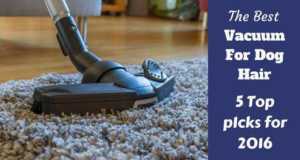 Remember, safety and durability are the most important factors, and be prepared to pay a little more if you want to get a high-quality product. You might want to update your rope toy recommendation. I’m taking my Golden to the emergency vet because the strings got balled up and are now causing a blockage. They are NOT veterinary recommended.